There are a number of cafe's on Mill Road but it was the fried bread on offer at the Tudor Rose cafe that lured me in. Inside it was quite quirky, it appeared to be cafe by day and Turkish restaurant by night. This is the seating area towards the rear. The classic condiment stack was a welcome sight. A really good coffee that is included in the price of the breakfast. It looked great when it arrived and did wonders for my hangover! If you like tomatoes you will love them here, really fresh, juicy and full of flavour. Yep, it went down a treat! Veggie option - Yes, 2 set veggie breakfasts or build your own. Thanks and glad you enjoy reading it! I will always visit a new place whenever I am in London, there are so many places I want to try there! As for putting a picture up, when I started the blog I did but then realised I would be better to stay anonymous incase cafe owners that had seen the blog recognised me when I visited. I started the blog after posting a few photos of fry ups on facebook, the amount of debate and comments on those photo lead to somebody saying "why not start a blog?" so I did. I try and eat just 1 fry up a week and love music (mainly psychobilly, punk and ska) I enjoy travelling, going to festivals and going to see as many live bands as I can. Thanks again! In reply to my first post, listen to a band called Kid British and see what you think, may need to listen a couple of times and see if it grows on you. I look forward to many more reviews. 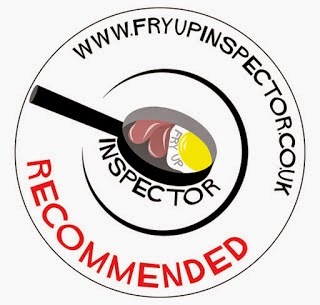 Hi Inspector; only recently discovered this blog and love it; its high time the great British fry-up got the recognition it deserves as one of our foremost contributions to world cuisine. Try to get up here to Scotland some time and review a few fry-ups. We don't have Britains worst heart attack rate for nothing you know! I did once visit Glasgow and ate some really nice Scottish breakfasts at the Victorian House Hotel, this was way before I started this blog though. I do hope to return to Scotland at some point. Once again, thanks for a great site. Theres only one thing to rival a classic British fry-up and thats a classic British mixed-grill; a different beast in my opinion. Scope for a future blog perhaps!? Glad you enjoy the site, I love a mixed grill too! Could well be a plan for another blog, not sure my heart could take it though! !